Today's lunch topic: Uniqlo, food and menus. Raymond thinks there is a connection and over lunch at Pulino's we discussed what it could be. We didn't order a lot but ended up trying a plethora of things - the escarole and white bean soup of the day, the delicious arugula and celery root salad, the proscuitto de parma, graciously brought out to tide us over to the pizza, and the star of lunch - the meatball special. 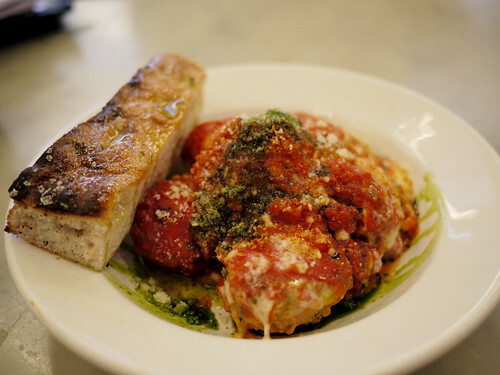 Italians don't eat their meatballs with overcooked spaghetti, slathered in sauce. They just eat them as they are, pure in form and taste. Looks like meatball shop. Is it as good as Meatball Shop?